The name RAV4 stands for Recreational Active Vehicle with 4-wheel-drive. The RAV4 is available as two- or four-wheel drive; it has a car-based unibody construction with a 4-cylinder engine and a five-speed manual or four-speed automatic transmission. This second-generation RAV4 is a rare compact SUV with a full-time AWD with a viscous limited-slip center differential. This means the RAV4 AWD system is always on. The majority of modern compact SUVs have a FWD-biased on-demand AWD where the rear axle only engages when required. The 2001, 2002 and 2003 RAV4 came with the 148-hp 2.0-liter 4-cylinder DOHC 1AZ-FE engine. Starting from the 2004 model year, the RAV4 received a 161-hp 2.4-liter 2AZ-FE engine. Both engines are reliable if maintained properly. Timing belt or chain Both 1AZ-FE and 2AZ-FE engines have a maintenance-free timing chain; there is no timing belt. Toyota RAV4 problems: A faulty ECM (engine computer) in 2001-2003 models can cause a problem with the way the automatic transmission shifts. According to many sources, the ECM warranty has been extended to 10 years or 150,000 miles. If you suspect having this problem in your RAV4, you might want to check with a Toyota dealer. The ECM needs to be replaced with an updated part to address this issue. A few other things to know about: Leaking engine valve seals can cause a blue or grey smoke at start-up. The air/fuel ratio sensors are fairly common to fail, often causing the Check Engine light with the code P1155. Replacing an air-fuel ratio sensor costs $65-$320 part plus $50-$150 labor. The mass airflow sensor can get dirty causing hesitation on acceleration. A worn-out steering rack can cause a clunking noise in the steering. Replacing a steering rack could cost from $600 to $1,000. The hinges of the rear swing door can wear out due to lack of lubrication and heavy spare tire. This may cause the rear swing door to be difficult to close. That's why it's important to have the hinges well lubricated. The difference in tire pressure or tire size can cause issues with the AWD system. It's important to keep the tire pressure up to the specs in all tires. 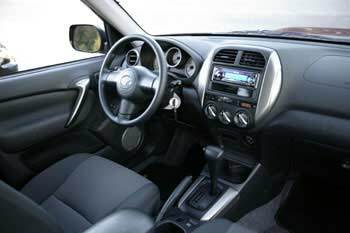 Inside: The RAV4's interior is simple and comfortable. High driving position offers very good all-around visibility. Controls are conveniently located and easy to use. The fit and finish is good. 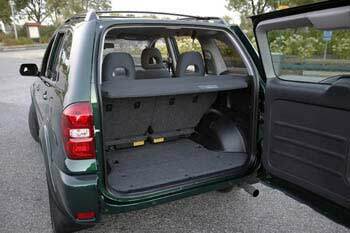 The rear swing door glass does not open separately as in the Honda CR-V, but the low cargo floor makes loading easier. On the downside, the cargo space is limited. Handling: Toyota RAV4 is agile and fun to drive. It handles like a car. The tight turning circle makes it maneuverable around town. The engine is a bit noisy and lacks highway passing power, but is very fuel-efficient. Fuel Economy: The RAV4 is one of the class leaders in terms of fuel economy. With mostly highway driving, the 2005 FWD RAV4 with a manual transmission gets up to 346 miles (557 km) on a 14.8-gallon (56 L) tank. Overall: The RAV4 is reliable and easy to maintain. Thanks to Toyota reputation for reliability, the RAV4 holds value well and you won't have troubles selling it. The cargo space is limited, but a rooftop carrier can help. Maintenance costs are low compared to other SUVs. Despite the problems mentioned above, the RAV4 overall reliability is still above average. Competitors include Subaru Forester and Honda CR-V.
Antilock brakes, traction control and stability control are standard from 2004. 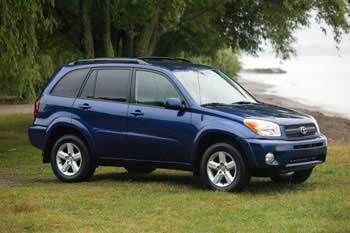 What to look for when buying a used Toyota RAV4: Before buying a used RAV4, check its history records, to verify that the vehicle wasn't involved in an accident or had other problems in the past. Watch out for a blue or grey smoke on start-up after the vehicle was sitting for a while. Usually it's more noticeable when the engine is started cold in the morning. Commonly the smoke is caused by bad valve seals. For 2001, 2002 and 2003 RAV4, you may want to check if the ECM has already been replaced with an updated part. If the "Check Engine" light is on, have the problem checked out before buying a vehicle. When test-driving, make sure, the automatic transmission shifts properly and smoothly in all conditions. Watch out for a clunking noise coming from the steering. Read our illustrated used car checklist for more info. Have the vehicle properly inspected before buying. Consider an extended warranty at least for the powertrain to protect from unexpected repair costs. AWD system: The RAV4's full-time 4WD system uses a viscous coupling center differential to distribute power to the front and rear wheels. When front wheels start slipping, more power is transferred to rear wheels and visa versa. The RAV4 is not a true off-roader, but its full-time AWD, light weight and compact size give this little SUV some advantage when leaving the pavement. Maintenance tips: Keep your tires properly inflated, it's especially important for an AWD model. Change transmission fluid regularly; it's best to use genuine Toyota transmission fluid. You can find transmission fluid capacity in the 'Specifications' section of your owner's manual. Keep all other fluids clean and topped up. In the 4WD models, transfer case oil and rear differential oil also need to be changed regularly. If you notice any issues with the way the automatic transmission shifts, have it looked at before the problem gets worse. Regular oil changes will help the engine last longer. When replacing a faulty ignition coil, it might be a good idea to replace all the spark plugs if they are old. When doing any repairs, it's always better to use original Toyota parts. Have your vehicle inspected in a repair shop annually to keep it safe. You can check the maintenance schedule online at the Toyota Owners website. The same website provides access to the electronic copy of the owner's manual. 2.0L (1AZ–FE): 4.4 US qt. or 4.2 liters. 2.4L (2AZ-FE): 4.0 US qt. or 3.8 liters. SAE 5W–30 engine oil is recommended.